This article is about the Japanese archaeological culture. For the Korean archaeological culture, see Jeulmun pottery period. The Jōmon period (縄文時代, Jōmon jidai) is the time in Japanese prehistory, traditionally dated between c. 14,000–300 BCE, recently refined to about 1000 BCE, during which Japan was inhabited by a hunter-gatherer culture, which reached a considerable degree of sedentism and cultural complexity. The name "cord-marked" was first applied by the American scholar Edward S. Morse, who discovered sherds of pottery in 1877 and subsequently translated it into Japanese as jōmon. 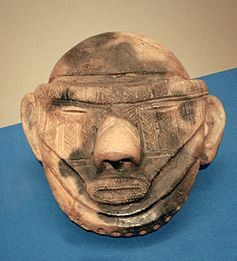 The pottery style characteristic of the first phases of Jōmon culture was decorated by impressing cords into the surface of wet clay and is generally accepted to be among the oldest in East Asia and the world. The Jōmon period was rich in tools and jewellery made from bone, stone, shell and antler; pottery figurines and vessels; and lacquerware. It is often compared to pre-Columbian cultures of the North American Pacific Northwest and especially to the Valdivia culture in Ecuador because in these settings cultural complexity developed within a primarily hunting-gathering context with limited use of horticulture. The very long, approximately 14,000 years, Jōmon period is conventionally divided into a number of phases: Incipient (16,500-10,000 years ago), Initial (10,000-7,000), Early (7,000-5,450), Middle (5,450-4,420), Late (4,420-3,220) and Final (3,220-2,350), with the phases getting progressively shorter. The fact that this entire period is given the same name by archaeologists should not be taken to mean that there was not considerable regional and temporal diversity; the chronological distance between the earliest Jōmon pottery and that of the more well-known Middle Jōmon period is about twice as long as the span separating the building of the Great Pyramid of Giza from the 21st century. Dating of the Jōmon sub-phases is based primarily upon ceramic typology, and to a lesser extent radiocarbon dating. Traces of Paleolithic culture, mainly stone tools, occur in Japan from around 30,000 BCE onwards. The earliest "Incipient Jōmon" phase began while Japan was still linked to continental Asia as a narrow peninsula. As the glaciers melted following the end of the last glacial period (approximately 12,000 years ago), sea levels rose, separating the Japanese archipelago from the Asian mainland; the closest point (in Kyushu) about 190 kilometres (120 mi) from the Korean Peninsula is near enough to be intermittently influenced by continental developments but far enough removed for the peoples of the Japanese islands to develop their own ways. In addition, a continuous chain of islands encompasses Luzon, Taiwan, Ryukyu and Kyushu, allowing for continuous contact between the Jōmon and maritime Southeast Asia. Within the archipelago, the vegetation was transformed by the end of the Ice Age. In southwestern Honshu, Shikoku, and Kyushu, broadleaf evergreen trees dominated the forests, whereas broadleaf deciduous trees and conifers were common in northeastern Honshu and southern Hokkaido. Many native tree species, such as beeches, buckeyes, chestnuts, and oaks produced edible nuts and acorns. These provided abundant sources of food for humans and for animals. In the northeast, the plentiful marine life carried south by the Oyashio Current, especially salmon, was another major food source. Settlements along both the Sea of Japan and the Pacific Ocean subsisted on immense amounts of shellfish, leaving distinctive middens (mounds of discarded shells and other refuse) that are now prized sources of information for archaeologists. Other food sources meriting special mention include Sika deer, wild boar (with possible wild-pig management), wild plants such as yam-like tubers, and freshwater fish. Supported by the highly productive deciduous forests and an abundance of seafood, the population was concentrated in central and northern Honshu, but Jōmon sites range from Hokkaido to the Ryukyu Islands. The earliest pottery in Japan was made at or before the start of the Incipient Jōmon period. Small fragments, dated to 14,500 BCE, were found at the Odai Yamamoto I site in 1998. Pottery of roughly the same age was subsequently found at other sites such as Kamikuroiwa and Fukui Cave. Archaeologist Junko Habu claims "[t]he majority of Japanese scholars believed, and still believe, that pottery production was first invented in mainland Asia and subsequently introduced into the Japanese archipelago." This seems to be confirmed by recent archaeology. As of now, the earliest pottery vessels in the world date back to 20,000 BP and were discovered in Xianren Cave in Jiangxi, China. The pottery may have been used as cookware. 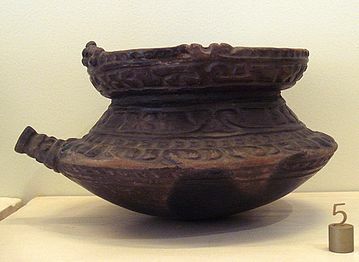 Other early pottery vessels include those excavated from the Yuchanyan Cave in southern China, dated from 16,000 BCE, and at present it appears that pottery emerged at roughly the same time in Japan, and in the Amur River basin of the Russian Far East. 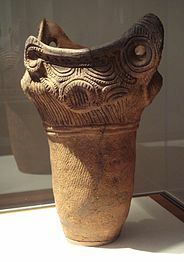 The first Jōmon pottery is characterized by the cord-marking that gives the period its name and has now been found in large numbers of sites. The pottery of the period has been classified by archaeologists into some 70 styles, with many more local varieties of the styles. The antiquity of Jōmon pottery was first identified after World War II, through radiocarbon dating methods. The earliest vessels were mostly smallish round-bottomed bowls 10–50 cm high that are assumed to have been used for boiling food and, perhaps, storing it beforehand. They belonged to hunter-gatherers and the size of the vessels may have been limited by a need for portability. As later bowls increase in size, this is taken to be a sign of an increasingly settled pattern of living. These types continued to develop, with increasingly elaborate patterns of decoration, undulating rims, and flat bottoms so that they could stand on a surface. The manufacture of pottery typically implies some form of sedentary life because pottery is heavy, bulky, and fragile and thus generally unusable for hunter-gatherers. However, this does not seem to have been the case with the first Jōmon people, who perhaps numbered 20,000 over the whole archipelago. It seems that food sources were so abundant in the natural environment of the Japanese islands that it could support fairly large, semi-sedentary populations. The Jōmon people used chipped stone tools, ground stone tools, traps, and bows, and were evidently skillful coastal and deep-water fishermen. The degree to which horticulture or small-scale agriculture was practiced by Jōmon people is debated. The hunter-gatherer conceptualization of the Jōmon period culture is part of scientific romanticized narratives. There is evidence to suggest that arboriculture was practiced in the form of tending groves of lacquer (Toxicodendron verniciflua) and nut (Castanea crenata and Aesculus turbinata) producing trees, as well soybean, bottle gourd, hemp, Perilla, adzuki among others. These characteristics place them somewhere in between hunting-gathering and agriculture. An apparently domesticated variety of peach appeared very early at Jōmon sites in 6700–6400 BP (4700–4400 BCE). This was already similar to modern cultivated forms. This domesticated type of peach was apparently brought into Japan from China. Nevertheless, in China, itself, this variety is currently attested only at a later date of c. 5300 to 4300 BP. By the end of the Incipient Jōmon phase, around 8000 BCE, a semi-sedentary life-style apparently led to an increase in population density, so that the subsequent phase, the Initial Jōmon, exhibits some of the highest densities known for foraging populations. Genetic mapping studies by Luigi Luca Cavalli-Sforza have shown a pattern of genetic expansion from the area of the Sea of Japan towards the rest of eastern Asia. This appears as the third principal component of genetic variation in Eurasia (after the "Great expansion" from the African continent, and a second expansion from the area of Northern Siberia), which suggests geographical expansion during the early Jōmon period. These studies also suggest that the Jōmon demographic expansion may have reached America along a path following the Pacific coast. The Early and Middle Jōmon periods saw an explosion in population, as indicated by the number of settlements from this period. These two periods occurred during the Holocene climatic optimum (between 4000 and 2000 BCE), when the local climate became more humid. Highly ornate pottery dogū figurines and vessels, such as the so-called "flame style" vessels, and lacquered wood objects remain from that time. Although the ornamentation of pottery increased over time, the ceramic fabric always remained quite coarse. This period saw a rise in complexity in the design of pit-houses, the most commonly used method of housing at the time, with some even having stone paved floors. A study in 2015 found that this form of dwelling continued up until the Satsumon culture. After 1500 BCE, the climate cooled, and populations seem to have contracted dramatically. Comparatively few archaeological sites can be found after 1500 BCE. During the Final Jōmon period, a slow shift was taking place in western Japan: steadily increasing contact with the Korean Peninsula eventually led to the establishment of Korean-type settlements in western Kyushu, beginning around 900 BCE. The settlers brought with them new technologies such as wet rice farming and bronze and iron metallurgy, as well as new pottery styles similar to those of the Mumun pottery period. The settlements of these new arrivals seem to have coexisted with those of the Jōmon and Yayoi for around a thousand years. Outside Hokkaido, the Final Jōmon is succeeded by a new farming culture, the Yayoi (ca. 300 BCE-300 CE), named after an archaeological site near Tokyo. Within Hokkaido, the Jōmon is succeeded by the Zoku-Jōmon (post-Jōmon) or Epi-Jōmon period, which is in turn succeeded by the Satsumon culture around the 7th century. The origin myths of Japanese civilization extend back to periods now regarded as part of the Jōmon period, though they show little or no relation to what we know archaeologically of Jōmon culture. 11 February 660 BCE is the traditional founding date of the Japanese nation by Emperor Jimmu. This version of Japanese history, however, comes from the country's first written records, the Kojiki and Nihon Shoki, dating from the 6th to the 8th centuries, after Japan had adopted Chinese characters (Go-on/Kan-on). Some elements of modern Japanese culture may date from this period and reflect the influences of a mingled migration from the northern Asian continent and the southern Pacific areas and the Jōmon peoples. Among these elements are the precursors to Shinto, some marriage customs, architectural styles, and technological developments such as lacquerware, laminated yumi, metalworking, and glass making. The relationship of Jōmon people to the modern Japanese (Yamato people), Ryukyuans and Ainu is diverse and not well clarified. Morphological studies of dental variation and genetic studies suggest that the Jōmon people were of southern origin, while other studies of bacteria suggest that the Jōmon people were of possible northern origin. According to recent studies the contemporary Japanese people descended from a mixture of the ancient hunter-gatherer Jōmon and the Yayoi rice agriculturalists, and these two major ancestral groups came to Japan over different routes at different times. Recent Y chromosome haplotype testing has led to the hypothesis that male haplogroups D1b (major component) and C1a1 (minor component), which have been found in different percentages of samples of modern Japanese, Ryukyuan, and Ainu population, may reflect patrilineal descent from members of pre-Jōmon and Jōmon period of the Japanese Archipelago. Analysis of the mitochondrial DNA ("mtDNA") of Jōmon skeletons from Hokkaido, Okinawa Island and Tōhoku region indicates that haplogroups N9b and M7a may reflect maternal Jōmon contribution to the modern Japanese mtDNA pool. In another study of ancient DNA published by the same authors in 2011, both the control and coding regions of mitochondrial DNA (mtDNA) recovered from Jōmon skeletons excavated from the northernmost island of Japan, Hokkaido, were analyzed in detail, and 54 mtDNA samples were confidently assigned to relevant haplogroups. Haplogroups N9b, D4h2, G1b, and M7a were observed in these individuals. According to 2013 study, there was mtDNA sub-haplogroups inter-regional heterogeneity within the Jōmon people, specifically between studied Kantō, Hokkaido and Tōhoku Jōmon. According to 2011 study all major East Asian mtDNA lineages expanded before 10,000 YBP, except for two Japanese lineages D4b2b1 and M7a1a which population expanded around 7000 YBP unequivocally during the Jōmon Period (14–2.3 kya), thousands of years before intensive agriculture which imply that the growth of population and depletion of food resources was the reason for population expansion and not agriculture. A 2017 study on ancient Jomon aDNA from Sanganji shell mound in Tōhoku region estimates that the modern mainland Japanese population probably inherited less than 20% of Jōmon peoples' genomes. Mark J. Hudson of Nishikyushu University posits that Japan was settled by a proto-Mongoloid population in the Pleistocene who became the Jōmon, and that their features can be seen in the Ainu and Ryukyuan people. The Jōmon share some physical characteristics, such as relatively abundant body hair, with Caucasians, but anthropological genetics shows them to derive from a completely separate genetic lineage from that of Europeans. Jōmon shows closest genetic relationship to East Asians rather than western Eurasian people. Late Jomon clay statue, Kazahari I, Aomori Prefecture, 1500–1000 BC. Late Jomon clay head, Shidanai, Iwate Prefecture, 1500–1000 BCE. A Middle Jomon jar. 2000 BCE. Final Jomon jar, Kamegaoka style. ^ a b Habu 2004, p. 3, 258. ^ a b Perri, Angela R. (2016). "Hunting dogs as environmental adaptations in Jōmon Japan" (PDF). Antiquity. 90 (353): 1166–1180. doi:10.15184/aqy.2016.115. ^ Timothy Jinam; Hideaki Kanzawa-Kiriyama; Naruya Saitou (2015). "Human genetic diversity in the Japanese Archipelago: dual structure and beyond". Genes & Genetic Systems. 90 (3): 147–152. doi:10.1266/ggs.90.147. PMID 26510569. ^ Kuzmin, Y.V. (2006). "Chronology of the Earliest Pottery in East Asia: Progress and Pitfalls". Antiquity. 80 (308): 362–371. doi:10.1017/s0003598x00093686. ^ Birmingham Museum of Art (2010). Birmingham Museum of Art : Guide to the Collection. [Birmingham, Ala]: Birmingham Museum of Art. p. 40. ISBN 978-1-904832-77-5. ^ Mizoguchi, Koji (2002). An Archaeological History of Japan, 30,000 B.C. to A.D. 700. University of Pennsylvania Press, Incorporated. ISBN 978-0-8122-3651-4. ^ 長野県立歴史館 (1996-07-01). "縄文人の一生". Comprehensive Database of Archaeological Site Reports in Japan. Retrieved 2016-09-02. ^ Koyama, Shuzo, and David Hurst Thomas (eds.). (1979). Affluent Foragers: Pacific Coasts East and West. Senri Ethnological Studies No. 9. Osaka: National Museum of Ethnology. ^ Aikens, C. Melvin (1992). Pacific northeast Asia in prehistory: hunter-fisher-gatherers, farmers, and sociopolitical elites. WSU Press. ISBN 978-0-87422-092-6. ^ Fiedel, Stuart J. (1992-05-29). Prehistory of the Americas. Cambridge University Press. ISBN 9780521425445. ^ "Archaeology | Studies examine clues of transoceanic contact". The Columbus Dispatch. Retrieved 2017-10-04. ^ a b c Crawford, Gary W. (2011). "Advances in Understanding Early Agriculture in Japan". Current Anthropology. 52 (S4): S331–S345. doi:10.1086/658369. JSTOR 10.1086/658369. ^ a b Hudson, Mark J. (1999). Ruins of Identity: Ethnogenesis in the Japanese Islands. University of Hawaii Press. ISBN 978-0-8248-2156-2. ^ a b Habu, Junko (2004). Ancient Jomon of Japan. Cambridge University Press. ISBN 978-0-521-77670-7. ^ a b Wu, X; Zhang, C; Goldberg, P; Cohen, D; Pan, Y; Arpin, T; Bar-Yosef, O (June 29, 2012). "Early Pottery at 20,000 Years Ago in Xianrendong Cave, China". Science. 336 (6089): 1696–1700. doi:10.1126/science.1218643. PMID 22745428. ^ Stanglin, Douglas (2012-06-29). "Pottery found in China cave confirmed as world's oldest". USA Today. ^ "Chinese pottery may be earliest discovered." Associated Press. 2009-06-01. ^ Kuzmin, Y.V. ; Keally, C.T. (2001). "Radiocarbon Chronology of the Earliest Neolithic Sites in East Asia". Radiocarbon. 43 (2B): 1121–1128. doi:10.1017/s0033822200041771. ^ Craig, O.E; Saul, H. (2013). "Earliest evidence for the use of pottery". Nature. 496 (7445): 351–354. doi:10.1038/nature12109. PMID 23575637. ^ Craig & Saul 2013. ^ Matsui, A.; Kanehara, M. (2006). "The Question of Prehistoric Plant Husbandry During the Jomon Period in Japan". World Archaeology. 38 (2): 259–273. doi:10.1080/00438240600708295. ^ Crawford, G.W. (1992) "The Transitions to Agriculture in Japan." In Transitions to Agriculture in Prehistory, edited by A.B. Gebauer and T.D. Price, pp. 117–132. Madison: University of Wisconsin Press. ^ Yang, Xiaoyan; Zheng, Yunfei; Crawford, Gary W.; Chen, Xugao (2014). "Archaeological Evidence for Peach (Prunus persica) Cultivation and Domestication in China". PLoS ONE. 9 (9): e106595. doi:10.1371/journal.pone.0106595. ISSN 1932-6203. PMC 4156326. PMID 25192436. ^ "Jōmon population densities are among the highest recorded for a foraging population, although in some areas of the Pacific Coast of North America, comparable and even higher figures of population densities have been observed (Hassan, 1975)." Luigi Luca Cavalli-Sforza, The History and Geography of Human Genes p249, ISBN 0-691-08750-4. ^ "The third synthetic map shows a peak in Japan, with rapidly falling concentric gradients... Taken at face value, one would assume a center of demographic expansion in an area located around the Sea of Japan." Luigi Luca Cavalli-Sforza, The History and Geography of Human Genes p249, ISBN 0-691-08750-4. ^ "The synthetic maps suggest a previously unsuspected center of expansion from the Sea of Japan but cannot indicate dates. This development could be tied to the Jōmon period, but one cannot entirely exclude the pre-Jōmon period and that it might be responsible for a migration to the Americas. A major source of food in those pre-agricultural times came from fishing, then as now, and this would have limited for ecological reasons the area of expansion to the coastline, perhaps that of the Sea of Japan, but also farther along the Pacific Coast." Luigi Luca Cavalli-Sforza, The History and Geography of Human Genes p253, ISBN 0-691-08750-4. ^ "三内丸山遺跡調査概報". Comprehensive Database of Archaeological Site Reports in Japan. Retrieved 2016-09-01. ^ "Early Jomon hamlet found". The Japan Times. May 27, 1997. ^ a b Moriya 2015. ^ Moriya, Toyohito (2015). "A Study of the Utilization of Wood to Build Pit Dwellings from the Epi-Jomon Culture" (PDF). Journal of the Graduate School of Letters. 10: 71–85. doi:10.14943/jgsl.10.71. ^ "Out of Sunda by Jomon Japanese | Southeast Asia | Earth & Life Sciences". Scribd. Retrieved 2017-07-05. ^ a b c Hideaki Kanzawa-Kiriyama; Aiko Saso; Gen Suwa; Naruya Saitou (2013). "Ancient mitochondrial DNA sequences of Jomon teeth samples from Sanganji, Tohoku district, Japan". Anthropological Science. 121 (2): 89–103. doi:10.1537/ase.121113. Retrieved 18 April 2017. ^ Hanihara, K (1984). "Origins and Affinities of Japanese Viewed from Cranial Measurements". Acta Anthropogenetica. 8 (1–2): 149–158. ^ a b Michael F Hammer; Tatiana M Karafet; Hwayong Park; Keiichi Omoto; Shinji Harihara; Mark Stoneking; Satoshi Horai (2006). "Dual origins of the Japanese: common ground for hunter-gatherer and farmer Y chromosomes". Journal of Human Genetics. 51 (1): 47–58. doi:10.1007/s10038-005-0322-0. PMID 16328082. ^ Rita Rasteiro; Lounès Chikhi (2009). "Revisiting the peopling of Japan: an admixture perspective". Journal of Human Genetics. 54 (6): 349–354. doi:10.1038/jhg.2009.39. PMID 19424284. ^ Yungang He; Wei R. Wang; Shuhua Xu; Li Jin (2012). "Paleolithic Contingent in Modern Japanese: Estimation and Inference using Genome-wide Data". Scientific Reports. 2 (355): 47–58. doi:10.1038/srep00355. PMC 3320058. PMID 22482036. ^ Youichi Sato; et al. (2014). "Overview of genetic variation in the Y chromosome of modern Japanese males". Anthropological Science. 122 (3): 131–136. doi:10.1537/ase.140709. ^ a b c Hideaki Kanzawa-Kiriyama; Kirill Kryukov; Timothy A Jinam; Kazuyoshi Hosomichi; Aiko Saso; Gen Suwa; Shintaroh Ueda; Minoru Yoneda; Atsushi Tajima; Ken-ichi Shinoda; Ituro Inoue; Naruya Saitou1 (February 2017). "A partial nuclear genome of the Jomons who lived 3000 years ago in Fukushima, Japan". Journal of Human Genetics. 62 (2): 213–221. doi:10.1038/jhg.2016.110. PMC 5285490. PMID 27581845. ^ Masashi Tanaka; et al. (2004). "Mitochondrial Genome Variation in Eastern Asia and the Peopling of Japan". Genome Research. 14 (10a): 1832–1850. doi:10.1101/gr.2286304. PMC 524407. PMID 15466285. ^ Adachi, N.; Shinoda, K.; Umetsu, K.; Matsumura, H. (2009). "Mitochondrial DNA analysis of Jomon skeletons from the Funadomari site, Hokkaido, and its implication for the origins of Native American". American Journal of Physical Anthropology. 138 (3): 255–65. doi:10.1002/ajpa.20923. PMID 18951391. ^ Ken-ichi Shinoda; Tsuneo Kakuda; Naomi Doi (2012). "Mitochondrial DNA polymorphisms in late Shell midden period skeletal remains excavated from two archaeological sites in Okinawa" (PDF). Bulletin of the National Museum of Nature and Science, Series D. 38: 51–61. Retrieved 5 February 2017. ^ Ken-ichi Shinoda; Tsuneo Kakuda; Naomi Doi (2013). "Ancient DNA Analyses of Human Skeletal Remains from the Gusuku Period in the Ryukyu Islands, Japan" (PDF). Bulletin of the National Museum of Nature and Science, Series D. 39: 1–8. Retrieved 5 February 2017. ^ Adachi N, Shinoda K, Umetsu K, Kitano T, Matsumura H, Fujiyama R, Sawada J, and Tanaka M, "Mitochondrial DNA analysis of Hokkaido Jōmon skeletons: remnants of archaic maternal lineages at the southwestern edge of former Beringia," Am J Phys Anthropol. 2011 Nov;146(3):346-60. doi:10.1002/ajpa.21561. Epub 2011 Sep 27. ^ Hong-Xiang Zheng; Shi Yan; Zhen-Dong Qin; Yi Wang; Jing-Ze Tan; Hui Li; Li Jin (2011). "Major Population Expansion of East Asians Began before Neolithic Time: Evidence of mtDNA Genomes". PLOS. 6 (10): e25835. doi:10.1371/journal.pone.0025835. PMC 3188578. PMID 21998705. ^ Koppel, Tom (2010). Lost World: Rewriting Prehistory---How New Science Is Tracing. Simon and Schuster. pp. 389–. ISBN 978-1-4391-1800-9. ^ Kanzawa-Kiriyama, Hideaki; Kryukov, Kirill; Jinam, Timothy A; Hosomichi, Kazuyoshi; Saso, Aiko; Suwa, Gen; Ueda, Shintaroh; Yoneda, Minoru; Tajima, Atsushi (2016-09-01). "A partial nuclear genome of the Jomons who lived 3000 years ago in Fukushima, Japan". Journal of Human Genetics. 62 (2): 213–221. doi:10.1038/jhg.2016.110. ISSN 1434-5161. PMC 5285490. PMID 27581845. Habu, Junko, "Subsistence-Settlement systems in intersite variability in the Moroiso Phase of the Early Jomon Period of Japan"
Koyama, Shuzo, and David Hurst Thomas (eds.). (1979). Affluent Foragers: Pacific Coasts East and West. Senri Ethnological Studies No. 9. Osaka: National Museum of Ethnology. Temple, DH (2007). "Stress and dietary variation among prehistoric Jomon foragers". American Journal of Physical Anthropology. 133 (4): 1035–1046. doi:10.1002/ajpa.20645. PMID 17554758. Temple, DH (2008). "What can stature variation reveal about environmental differences between prehistoric Jomon foragers? Understanding the impact of developmental stress on environmental stability". American Journal of Human Biology. 20 (4): 431–439. doi:10.1002/ajhb.20756. PMID 18348169. Wikimedia Commons has media related to Jōmon period. BBC audio file (15 minutes). Discussion of Jomon pots. A History of the World in 100 Objects. Comprehensive Database of Archaeological Site Reports in Japan, the Nara National Research Institute for Cultural Properties.